Kaliella gregaria, a spectacular Euconulid from Borneo. Picture: © Menno Schilthuizen (North Borneo Land Snails). Hive snails are a family of small or tiny terrestrial snails, whose largest diversity of species is to be found in the Pacific area. Hive snails have a conical shell resembling a hive, hence their name. Like slugs of the Arion genus, hive snails have a groove at the end of their foot, where the mucus they crawl on is collected in a clot to be recycled back into the body. The genus name Euconulus means "lovely little cone". Hive snails share their superfamily, the Gastrodontoidea, with true glass snails (Oxychilidae), such as Oxychilus and Aegopinella, as well as the tiny crystal snails (Pristilomatidae). Formerly, the Euconulidae were believed to be a part of the superfamily of glass snail relatives (Vitrinoidea). Modern molecular genetics has rendered this assumption obsolete. Relatives of glass snails (Vitrinoidea). Source: Mollbase on http://www.mollbase.de/list/, Fauna Europaea on http://www.faunaeur.org. (Switzerland). Picture: © Stefan Haller, (schneckenfoto.ch). Description: The brown hive snail has a yellowish brown shell, which is quite lightly coloured on the upper side, looking silkily smooth on the underside. The shell has no visible shell navel (umbilicus) and the apertural whorl shows a slight blunt keel. Dimensions: H: 2 - 2.5 mm; W: 2.8 - 3.5 mm. (Abbreviations). 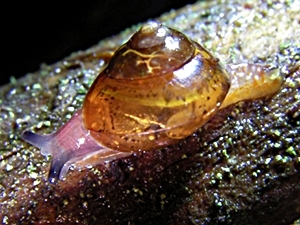 Habitat and Distribution: The brown hive snail lives in forests of all kinds, preferring cool and humid grounds with fallen logs in montane and alpine coniferous forests. On the other hand, Euconulus fulvus does also appear in dry and humid meadows and alpine grass habitats, tolerating habitats poor in limestone. The species is distributed holarctically (see: Faunal provinces of the Earth), it appears in all of Europe, in Switzerland in altitudes of up to 2900 m MSL, but it becomes quite rare beyond 2400 m MSL. 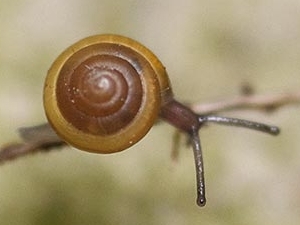 In Switzerland, Euconulus fulvus is one of the most common snail species, after the copse snail (Arianta arbustorum) and the rounded disc snail (Discus rotundatus). Francisco Welter-Schultes: Euconulus fulvus species homepage. There are more Euconulus species in Europe, about which opinions are divided: The species Euconulus alderi (Gray 1840), present on the British Isles, appears to be different enough on the European mainland, to constitute a different species referred to as Euconulus praticola (Reinhardt 1883). Apart from those two, there is at least on other European species of Euconulus, the dark forest hive snail, Euconulus trochiformis (Montagu 1803). Falkner, G.; Ripken, T. E. J.; Falkner, M. (2002): Mollusques continentaux de France. Liste de Référence annotée et Bibliographie. Paris (Musée National d'Histoire Naturelle). Bill Frank and David Kirsh: The six Euconulus species of the Eastern United States. Menno Schilthuizen (National Museum of Natural History Naturalis, Leiden): North Borneo Land Snails.